Though he never really took an extended break from the ice, Duncan hadn't played hockey for a few months when he signed up for "The Sunday Skate" coached by Adam Duskocy during the summer of 2014. He'd first met Coach Duskocy with the CT Werewolves a couple of months earlier and he was a huge asset to Duncan's development at the time. With summer vacations already scheduled, Duncan was only able to attend three sessions and I was a little hesitent to sign him up as I wasn't sure if it was geared to kids at Duncan's level or age, barely 5 at the time, but Coach Adam assured me via email that he'd be fine. Duncan was certainly amoung the youngest in the group but this was his first experience where there wasn't a single kid slowing everyone down. No pucks on the ice but Adam kept the kids moving non-stop barking out encouragement the entire time. Almost like a personal trainer on ice. I'd never seen Duncan move so fast or take corners so tight. In fact, I haven't seen him do that since. A couple of months later while heading into a Friday night public skate session, we crossed paths with Coach Adam as he was coming out of the arena following what I'd assume was a men's league game. Literally, in the two seconds we held the door for him to get his hockey bag through the door, he made a point to say hello to both me and Duncan, even shaking hands, as we walked by. I'm by no means a hovering parent. I don't seek out the coaching staff. I don't stand on the bench during practice. In fact, I try my best to blend into the walls so the fact that he recognized me was a little surprising. Further, I'd bet, given a second more, he probably would have been able to pull Duncan's name out of a hat too. Considering it was just 3-sessions of skating and maybe 2 practices with the CT Werewolves over a timespan of 7 months, that fact that he recognized my 5 year old (without his helmet or any gear on) left an impression on me. Pretty impressive for a guy that that's President and Coaching Director for an entire youth hockey program... that Duncan doesn't even participate in. I know that as my boys age, more and more hockey camps will be available to them but this one is by far the best one we've attended for the "pre" mite age group. High pace, hard work, and fun. Okay, so all of the above was written four years ago when my son was 5 years old -- practically ancient history in terms of youth hockey so I figured it'd be best to add to this original review. So, fast forward 4 years and Duncan's working with Adam Duskocy once per week this off-season utilizing the Duskocy Power Hockey "Sunday Skate" program. It's pretty much a group format power skating clinic -- maybe 10 kids each Sunday. Duncan is still one of the youngest participants but there isn't a huge age variation. And, while it has the exact same name and format that it always has since he started offering these clinics, the kids he's training are all still within that 2007 to 2010 birth year window. If a barely 5-year old showed up today, well, yeah, they'd never be able to keep up. I mean, the skill level is at the point where I wouldn't register Henrik for it. He's a solid skater for a 7 year old but would certainly struggle and fall behind here. But that's the best thing about the sessions Adam Duskocy runs -- there never seem to be players that don't belong. Every player I've seen this summer is a highly skilled squirt. So hard to find appropriate skill level group lessons...so hard. As such, and hardly surprising, a vast majority of the skaters are kids that play under the Mass/Conn United umbrella -- coach Duskocy was the '08 Elite coach there last season, plus Duncan from the CT Chiefs, and one kid that showed up a handful of times in a Simsbury jersey that worked his tail off trying to keep up with the pace...and then disappeared. Adam's tone is different than when I wrote the last review but that's not a bad thing -- these aren't kids just learning to skate anymore. They're elite hockey players. He talks to them like adults and pushes them like adults too. It's not geared to be a "go out and have fun" type of camp and, based on the stickers on all of the helmets there, the families signing up aren't looking for that sort of thing to begin with. These kids are committed to getting better. And, just as in the past, the small tweaks Adam shows the kids when it comes to using your arms or how to get more out of each stride are unmatched, I've found. Still. He's always gotten a lot out of my son -- I just wish I could get him to coach in a private session rather than a group session. A single hour every now and then would be hugely beneficial. That's not a knock on his camps at all -- he does help each player individually and does so in a subtle way so as not to embarrass anyone. His voice cuts through ambient rink noise -- if he's calling out instruction, you can hear it. But when someone is doing something incorrectly, that voice disappears -- he'll still call them out, but quickly, quietly, and privately so none of the other players even notice someone is being corrected. Unlike so many other "group" trainings, what I like the best is that he's super specific about doing it right, not necessarily fast. That's not to say the sessions aren't fast paced -- he keeps those kids moving. And just look at the video over there. Do those kids look 9 and under? 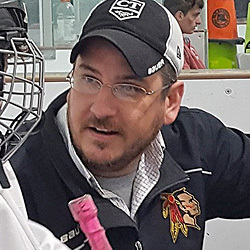 And while there are a few little things that irk me like wide turns on the inside edge -- sideline coaching critic, right here -- overall, he's a great fit for high end players that are looking to work hard. He's in that, like, incredibly rare spot of being a coach and a great teacher at the same time. To date, I've only encountered 3 people that are that perfect mix. So, yeah, Duskocy Power Hockey certainly isn't for the pre-mite age group anymore -- it's growing up with Adam's son -- it's still the most effective group-based training program we've found outside of our regular team practices. He made Duncan a better player when he was five. He's making him a better player again at nine. As a parent, that's the only return I'm looking for. » Is Elite Hockey really Better?